A Muggy Weld customer presented this rare pot metal/white metal classic car part to Mike for repair. The part had been damaged with a drill, and to keep the part original, the resulting hole would require a low temperature filler rod–Super Alloy 1. A piece of wood is used to “back” the repair, and after cleaning the oxidation in and around the hole, the filler rod is applied. 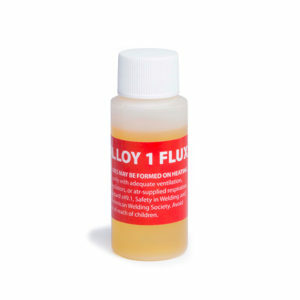 Simply add Super Alloy 1 flux, preheat the parent metal using indirect heating, then watch for the flux to turn root beer brown. At proper working temperature, Super Alloy 1 will not discolor the existing chrome surrounding the hole during the soldering process. Note: Always keep your torch moving when bringing the part to temperature. When you see the flux starting to turn brown, add a couple more drops of flux just before tinning the surface with the rod. This technique will help to build a bridge around and across the hole.